Today marks the end of the second week of my divemaster course. This week has been packed full of skill circuits, knowledge reviews, fun dives, assisting with courses, the works! One of the most exciting moments this week was when I assisted divemaster Jen on an open water fun dive. 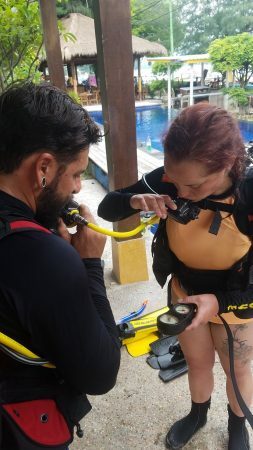 As he was doing his briefing, he introduced me to the guests as “Divemaster Trainee Kate” and in that moment, it really felt like the real deal. The rest of the week, it felt natural to take initiative and help with guests and duties around the shop. During my time here, there have also been two gentlemen here working on their dive instructor course. The course director Restuning has invoked my help as a “student” for the purpose of their course. I have completed my skill circuit practices and test this week but it was quite fun to pose as a student with problems for the purpose of teaching. I learned quite a bit from this experience in addition to what I’m learning from my own course work. Aside from all of my new learning experiences, I have had the exciting privilege of getting to know this charming little island. The locals are warm and amiable, greeting me with smiles around every corner. There is a man with a bakso cart that stops in front of the shop everyday. I am not the only person that lights up when he arrives. After weeks of eating local food, it was quite a treat to eat at Mammas Pizza on the east side of the island. The restaurant dons beanbags in the sand with strings of twinkling lights overhead. The tables are right by the water, making it the perfect place to enjoy a sunset. The pizza is some of the best I’ve had as the place is owned by an Italian couple. I am looking forward to experiencing Amed but I have fallen in love with this island. I have one week left here and will be cherishing every moment of it. I know I will come back again to catch another epic sunset.